Hi Kids! I am so glad you are joining us! We are about to go on an adventure. An adventure into the green world of plants where we will find a magical world of healing and friendship. Here we will start with some basics. What is an herb? How can you use herbs? Then over the next seven weeks we will learn how to make simple but effective medicines with much loved children’s herbs. We will also talk about planting a beautiful, whimsical garden, meeting our local wild herbal friends, and creating delicious recipes in the kitchen. So are you all ready to learn about the magic of herbs and herbalism? It is such fun! When learning about herbs, you will encounter many interesting and sometimes strange words. Here is a key to help you understand some of the words in this article. Botanist: Another name for a scientist that knows all about plants. Herbalist: A person who uses plants along with other natural substances (like honey and clay) to promote wellness and healing. Herbaceous Plant: Tender, soft plants that die back to the ground each year. Woody Plant: A plant the contains wood and grows year after year, such as a tree. Culinary Herbs: Herbs that people use in cooking. In order to play with and enjoy herbs, we need to know what an herb is, don’t you agree? If you talk to a botanist, they would say that an herb is any plant that flowers, dies all the way back to the ground each year and is soft, not woody. Examples of woody plants are trees and bushes with hard trunks, while examples of herbaceous plants are chamomile and pansies. But what if you ask an herbalist? They would tell you that an herb is any plant that will help take care of and even heal people and animals. Even woody plants like elder and hawthorn trees are herbs. The world is filled with these amazing helping plants. In fact, we are still discovering helpful plants all over the world. You should know that while herbs can be wonderful for us and bring us happiness, not all herbs are safe. Some plants are poisonous and can hurt you. For example, have you ever met poison ivy? If you simply brush up against this plant, poison ivy is liable to give you a nasty, itchy rash. This is one plant to leave alone! Other plants to avoid include datura, morning glories, and foxglove. Sometimes it is hard to tell the difference between a dangerous plant and a safe plant because they may look similar. An example of this is poison hemlock, which happens to strongly resemble many other edible plants in the Apiaceae or parsley family such as wild carrot. Some useful herbs have a stronger action on the body than other herbs and too much of a strong herb can make you feel sick instead of good. So, it is important that you have permission to touch, taste, or use herbs from a trusted adult such as your parent. Never assume that the plant you have is safe without checking in with an adult who is comfortable with herbs. Why Would I Want To Use Herbs? Herbs have been used for thousands and thousands of years by humans. It used to be common for people to use herbs for food, healing sick people, and for taking care of their bodies. Nowadays, most folks have forgotten about these wonderful plants and how to use them. So this is very special knowledge you are learning. It is something you can use for yourself and for those you care about. Sometimes it feels like magic! You have a tummy ache. You are sick with a cold. You are having a hard time sleeping. What Part of the Herb Should I Use? Herbs used in herbal medicine have many different parts, just like the plants they come from! They may have useful flowers, leaves, stems, roots, berries, seeds and even bark. Which part of the plant you use depends both on the plant you wish to use and the actions the part of the plant provides. For example, rose petals and rose hips will help you in different ways. The petals are wonderful for lung infections and will help the heart feel happy. Used in the bath, rose petals gently cleanse and soothe the skin (and they smell amazing). The fruits of the rose, called rose hips, are high in a nutrient called vitamin C which gives the body good nourishment that helps keep you from getting sick. It is important to develop a relationship with each plant that you use. But don’t worry, it takes time to learn. Learning about plants is like walking an adventurous road that takes you to magical places where you make all kinds of green new friends. Chamomile Flower Blossoms Calms an upset and nervous tummy. Lemon Balm Leaves Helps you when you are so tired that you can’t calm down. Mints Leaves Helps relieve tummy aches with lots of gas. Cinnamon Bark Warms you right up if you are cold! Elder Flowers & Berries Helps you feel better when you have cold or flu. Anise Seeds Yummy relief for coughs and stomachaches! Download and print these Herb Flashcards on 4×6 index cards to study! Once you get to know more about herbs, you will find that they are fun and easy to use! Using them in everyday life as part of your cooking and bathing will give you a great and powerful connection to them that provides deep nourishment for your body and mind. 1. Making and drinking teas with plants is a lovely way to start using herbs. You can try each herb as a tea and see how you like it. Then those very same teas can be used to make delicious things like popsicles or you can even use them to cook with when you are making something with a water base, like soup or smoothies. Taking care of the outside of your body is important and herbs can be a wonderful part of body care. Put some tea in your bath or make it into a lovely foot soak. 2. You can also use herbs in cooking. Have you ever used cinnamon when baking cookies? Or perhaps added some garlic to guacamole or pasta sauce? Yes? Then you have used herbs in your cooking. Herbs add all kinds of wonderful flavors to food and many culinary herbs help your body digest food well. They also often have other helpful properties such as helping during illness and relieving tummy aches. 3. Herbs make good medicine. By using herbs as medicine, you can help yourself and those you care about feel better. As you learn about using herbs, you will learn how to use them safely for helping to ease discomfort and assist the body in healing. For example, if you were to have a cold with a headache and perhaps were having a hard time sleeping, you could consider drinking a nice cup of catnip tea. The catnip would help your body fight the infection while also easing your headache and helping you get to sleep. 4. Many herbs are just simply beautiful! When something is beautiful to look at and beautiful to smell, it makes people happy. And that is just what herbs can do. When you smell a rose or a violet and feel your heart lighten — well, that is part of the magic of herbs! Thanks for reading, I hope you had fun! Here are some herbal activities to enjoy. Can you find the following types of plants? Where did you find it? How about a woody plant? Find some herbs in your kitchen and if it is ok with your parents, smell and taste them. 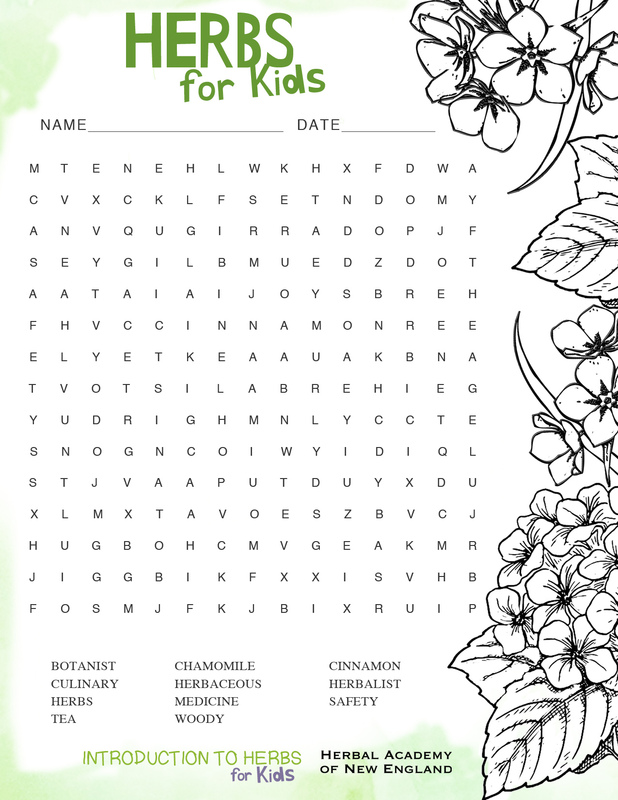 Print the Herbs for Kids Word Search and try to find the words we talked about in this lesson! Create a special place to keep all the information you are learning about herbs, such as a folder, box, or even a file on your computer or iPad. Then research a couple of herbs and learn more about them. See if you can find a picture of what the herbs look like. Think about how would you use them in your life. Take some notes and add them to the information you are collecting. If you like to cook, get in the kitchen and cook something with tasty culinary herbs such as cinnamon, ginger, garlic, rosemary, or thyme. All of these herbs go way beyond just tasting good, they are good for your body, too! Thank you for joining us on our herbal adventure! In this Herbs for Kids Series of eight lessons we will be learning about simple ways for children to engage with herbs. Certainly these are some of the most important and powerful ways to use herbs. There is a lot of comfort, nourishment, and healing in a cup of tea! The herbs we will be discussing are gentle plants that are full of vitamins, minerals, and other helpful constituents. This is a great opportunity for you to learn along with your child. Please help your kids be safe when using herbs (see the note above about safety). It is important that kids be supervised when using herbs especially if they are very small. Instruct your child(ren) to always check with you first before handling or ingesting any plants. We will be talking about herbs that are generally considered to be safe for children. If your child is a sensitive soul or has allergies, you should consider doing a “scratch test” with them when introducing each new herb. To do a scratch test, take a small amount of the herb and rub it on your child’s inner arm. Wait 24 hours to see if there is any reaction before using the herb with your child. There are many ways to support your child in their learning. Look online or in an herb book for pictures of some of the herbs mentioned above. Read a bit about them together. Go out and explore the vegetation in your yard and neighborhood. What is already growing near you? Do you have any herbs growing in your garden already? Talk about the herbs you already use. What do you have in your kitchen? Do you drink herbal tea? Parents who would like to learn more about herbs may consider becoming a member of The Herbarium or studying in one of our online herbalism programs. Get all the lessons in the Introduction to Herbs for Kids series here.